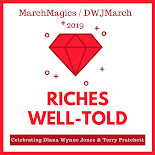 Since it's always difficult to review later books in a series (especially mysteries) without giving anything away, I'm going to try something new and simply highlight the series when I finish another book and try and convince you to try the series for yourself. 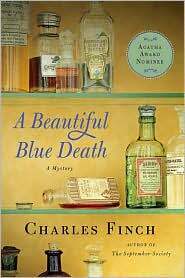 Beginning with A Beautiful Blue Death, Charles Finch has now written four books in the Charles Lenox series. Lenox is an aristocrat in Victorian England, a younger brother who has neither title nor occupation. To fill his time, he has begun acting as a private investigator -- a profession that is frowned upon by his peers and yet one that comes in handy when they end up needing his unique services. Lenox's next door neighbor in London is the widow Lady Jane Grey, a friend from childhood and possibly the love of his life. He is assisted in his investigations by the bored and alcoholic Dr. Thomas McConnell and the somewhat-reformed young libertine Lord John Dallington. I've reviewed the first three books here, here and here and now I've read the newly released A Stranger in Mayfair , which may be the strongest in the series. I enjoy Lenox's unique viewpoint on matters of class and privilege. He is one of the wealthy and idle but is not comfortable with the life he was born to. And yet, by choosing a profession, even if he works unpaid and usually unappreciated, he has set himself up as an outsider in his own circles. If you're looking for a mystery series with a bit of depth and a smidge of chaste Victorian romance, do yourself a favor and try this one. Support our site and buy A Beautiful Blue Death , The September Society , The Fleet Street Murders and A Stranger in Mayfair on Amazon or find them at your local library. I have borrowed most of these from the library and later bought my own copies. They certainly sound worth trying, Kristen. If I had a friend who was a private detective, I hope I would never need his services! I bought the first of these for my wife for Christmas and look forward to her thoughts on it. Problem is I bought her a ton of books for Christmas and she hasn't gotten to this one yet, LOL. Tracy - I like these mysteries that are a little heavier than cozies but not crime novels. Jenners - Seriously! "Oh hey, someone appears to have died in my house. Can you figure out who did it?" Carl - I hope she likes the first one and goes forward with the series. I know how long it can take to get through Christmas books, though, especially in our crowd! A STranger in Mayfair has a beautiful cover! Marie - This series has some of my favorite covers ever. If I could display them face forward on my shelves, I would!